This entry was posted on February 11, 2019, 11:00 AM and is filed under Apparatus on-scene, Fire Department History. You can follow any responses to this entry through RSS 2.0. Both comments and pings are currently closed. The rigs were not “donated” to East Chicago. Some salesman thought they had such an “in” with the CFD that the purchase of a great many more rigs was on the horizon and they started building them before a contract was ever in place. There were 6 2001 American LaFrance Eagle/3D 1500/500 engines built at the same time. Only 1 went to Chicago as Engine 23. Two remained in the CFD color scene and went to East Chicago IN as Engines 1 & 4. The last 3 got repainted and went to Baltimore County as Engines 2, 4, & 6. That info is from Indianafiretrucks website. On the ECFD page. This was an emergency purchase and also the commissioner at the time wanted to experiment with a commercial chassis for CFD. TL 5 and E 23 were also emergency purchases. ALF on their own decided to build I believe 4 more engines like 23 and maybe 1 more like 92. CFD had never placed an order for them and CFD did not purchase them. They were sold to a couple of different places, I believe East Chicago and maybe Baltimore. I believe along with the old Tower 5 and Engine 23 these were emergency purchases. I believe there were originally 5 or 6 ALF engines in the order but the CFD donated the others to East Chicago which I believe was also in dire straights as well. Was this a one time or perhaps an emergency purchase? 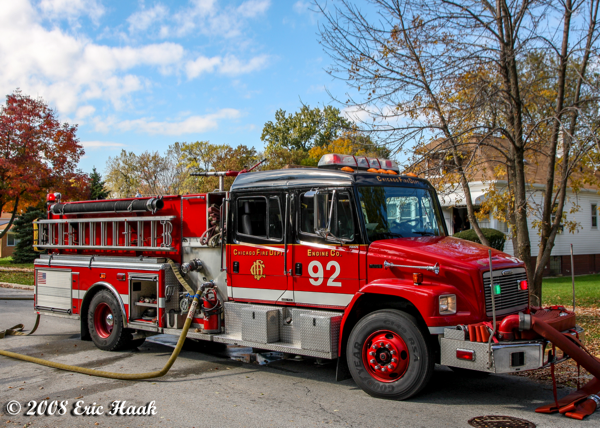 There will never be another engine like it in the CFD again! Ah, the Unicorn! Thanks for sharing Eric!